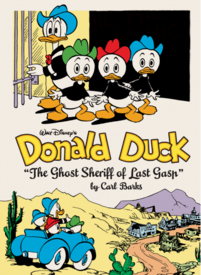 Donald Duck: "The Ghost of Last Gasp"
Fans of the classic Barks ten-pagers from Walt Disney's Comics & Stories will rejoice upon opening this volume, for the table of contents reveals that in addition to it's title track, "The Ghost Sheriff of Last Gasp," this volume consists almost entirely of these works, nineteen in all (! ), spanning from the close of 1953 all the way through middle of 1955, making for a collection that is bulging with the finest slapstick comedy comics you'll find anywhere and featuring all the characters in the Barks pantheon: Huey, Dewey and Louie, Uncle Scrooge, Gladstone Gander, Daisy Duck, Gyro Gearloose and more. This volume is rounded out with the ultra-rare, Donald Duck Tells About Kites giveaway comic book commissioned by a California electric utility company, that Barks drew from a corporation-prepared script, and, conversely, the four-page story, "Tennis Match" from Donald Duck #36 which Barks scripted but with art by Tony Strobl. 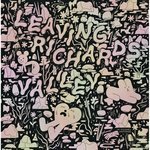 In addition there is a cover gallery of all the Barks covers from this period along with the comprehensive end-of-volume notes on each piece that are essential reading for all Barks fans. Donald Duck: "The Lost Peg Leg Mine"
Uncle Scrooge, "The Lost Crown of Ghengis Khan!" Donald Duck: "Terror of the Beagle Boys"
Donald Duck: "Trick or Treat"
Uncle Scrooge: "The Seven Cities of Gold"
Donald Duck: "The Pixilated Parrot"